UNESCO is excited to launch Women Make the News 2017. 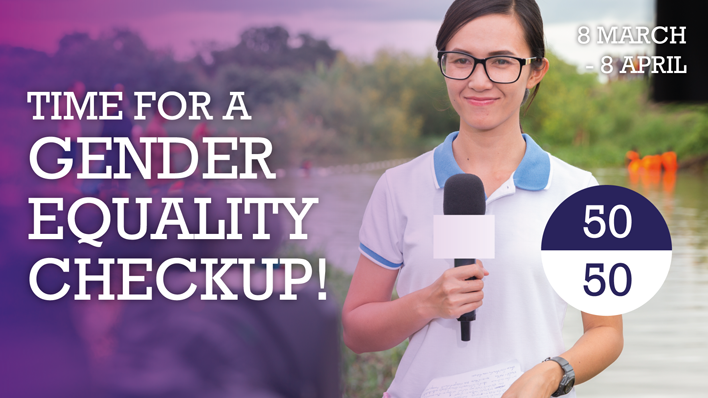 We are inviting editors-in-chief, editors, journalists, reporters and bloggers from newspapers on and offline, radio and television to join the initiative by taking part in the Gender Equality Checkup. We are also encouraging journalism schools, NGOs, intergovernmental bodies and media tech companies to participate as well. The general public is also invited to take part by applying the Gender Equality Checkup to their favourite media source during the months of March and April. Launched annually on the occasion of the International Women’s Day (8 March), Women Make the News is a global initiative first celebrated in 2000, aimed at fixing global attention on an issue relating to gender equality in and through the media, driving debate and encouraging action-oriented solutions until global objectives are met. The action for this year will be the Gender Equality Checkup that UNESCO has developed using the Gender-Sensitive Indicators for Media. The Gender Equality Checkup is designed for news media organizations to continue their transformation processes to be ready to take on the challenges of the 21st century. It also contributes to the theme of International Women's Day 2017: Women in the Changing World of Work: Planet 50-50 by 2030, held on 8 March, 2017. The aim of the checklist is to encourage gender equality in the newsroom and the community as a whole, resulting in less gender bias in media and a fairer society for all. It's also a way to encourage progress on the Sustainable Development Goals, especially Goal 5: Achieve gender equality and empower all women and girls. Click here to take the Gender Equality Checkup today!